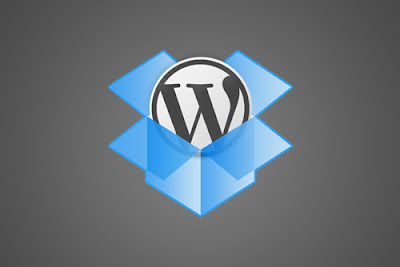 WordPress Backup to Dropbox is a free plugin for WordPress that automatically uploads a backup of your entire website, including all files and its database, to Dropbox. This free plugin keeps your valuable WordPress website, its media and database backed up to Dropbox in minutes with this sleek, easy to use plugin. You can choose the date, time and frequency for the backup to dropbox. 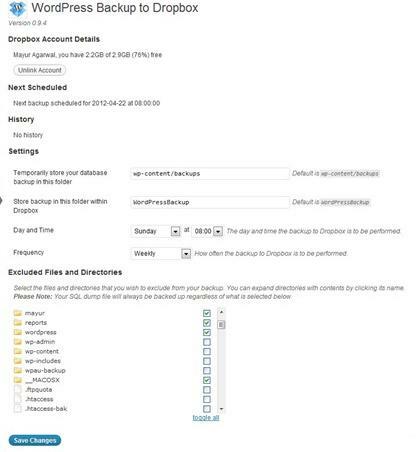 Just choose a day, time and how often you wish yor backup to be performed and kick back and wait for your websites files and a SQL dump of its database to be dropped in your Dropbox! 1 - The plugin will ask you to authorize the plugin with Dropbox. 2 - A new window open where Dropbox will ask you to authenticate in order allow this plugin access to your Dropbox. 3 - Once you have granted access to the plugin click continue to setup your backup. If the backup encounters a file that is larger then what can be safely handheld within the memory limit of your PHP installation, or the file fails to upload to Dropbox it will be skipped and a warning will be raised. The plugin attempts to recover from an error that may occur during a backup where backup process goes away for an unknown reason. In this case the backup will be restarted from where it left off. Unfortunately, at this time, it cannot recover from other errors, however a message should be displayed informing you of the reason for failure. You can visit plugin website or author blog.